The Arkansas River in central Colorado is the country’s number-one whitewater rafting destination for good reason, according to the Arkansas River Outfitters Association. Rafting sections such as the Royal Gorge and the Numbers offer some of the country’s most technical boating challenges, while families can choose mild float trips on different sections of the river with an easy riverside lunch. Variety is what makes the Arkansas River the country’s most popular rafting destination. Beginning as a trickle high in the Colorado Rockies, the whitewater cascades southeast through Colorado, offering Class II-V sections as it drops 4,650 feet over 100 miles before leaving the Rocky Mountains. The iconic Class III-IV run in Browns Canyon National Monument is available to kids ages 7 and up. The run is as popular for its granite spire walls that plunge to the river’s banks as it is for its intermediate-level rapids. Visitors can choose from half-day, full-day and multi-day camping trips on the river. The variety of trip offerings and activities supports the amount of activity, according to Bob Hamel, executive director of the Arkansas River Outfitters Association. The Arkansas Headwaters Recreation Area follows the river’s length, providing visitors dozens of entry points near Buena Vista, Salida, and Cañon City. Nearly a quarter of a million visitors went rafting on 44,000 commercially guided trips last year, according to park managers. 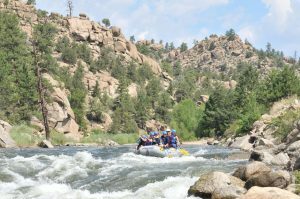 Among the state of Colorado’s 29 rafting sections, the Arkansas River offers the longest stretch of whitewater, the longest boating season into September, and hosts more than 40 percent of the state’s visitors who go rafting. The Arkansas River Valley also attracts kayakers and private boaters from around the world. For information about planning a Colorado whitewater rafting adventure, contact an Arkansas River Outfitters Association member. AROA consists of knowledgeable, experienced and licensed professionals who are dedicated to offering world-class whitewater adventures on the Arkansas River in Colorado.